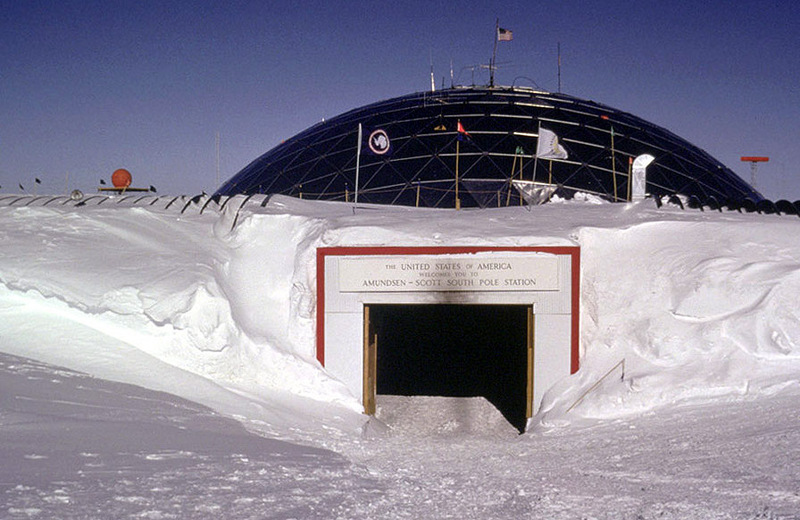 When the U.S. Navy Seabees first constructed the South Pole station in 1956 they built a second level atop the first, knowing the lower level would be covered with snow drift within a few years and the second level would then be flush with the ground. 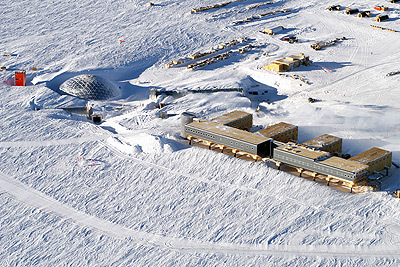 Entrance tunnel to the South Pole Station 2008, arches that house generators, vehicles and workshops come off to the left and right. Inside the dome, windows boarded up for insulation, note the icicles formed from condensation hanging from the roof. The Dome and Aerofoil stations together for a brief time before the dome was dismantled and removed, the new station is only part-clad (grey) in this picture. 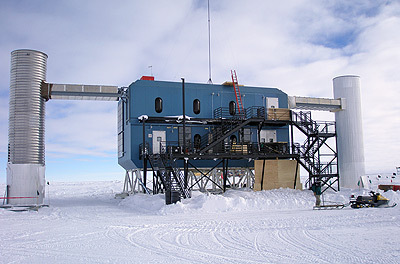 The leading edge of the aerofiol that faces the wind, in the foreground the ceremonial South Pole marker. The South Pole radio telescope, the very clear and dry air at the pole make it the best place on earth to have a space telescope. 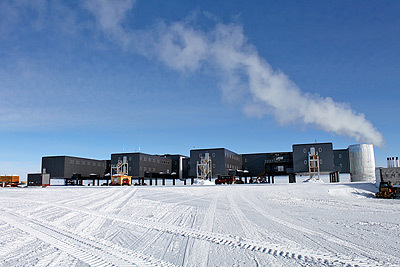 The station stands at the geographic South Pole, 90°S 0°W, at an elevation of 2,835 meters (9,306 feet) on Antarctica's nearly featureless ice sheet. The ice is about 2,700 meters (9,000 feet) thick at that point. 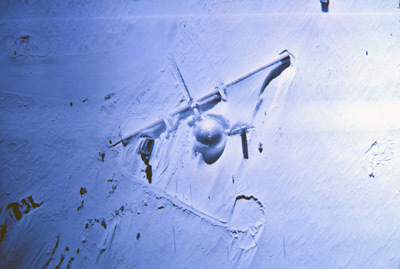 The station drifts with the ice sheet at about 10 meters (33 feet) each year. 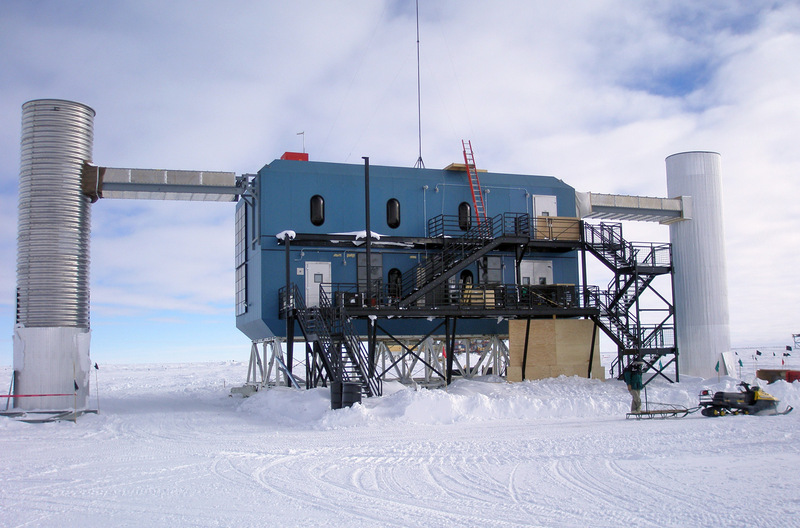 The South Pole suffers less ice accumulation (60-80mm / 3" per annum) than many places in Antarctica, but nonetheless there is constant addition to the level and no melt so buildings become buried over time. Wind blown snow forms drifts and tails around buildings, so the build-up can be significantly greater than the accumulation alone would imply. 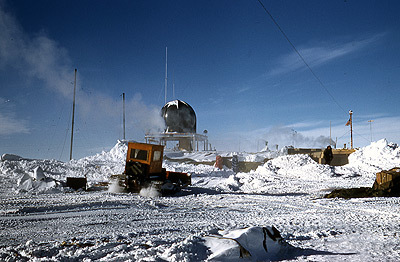 A base at the South Pole was established by the US Navy for the International geophysics Year (IGY) in the austral summer of 1956/57, the first winter-over at the pole was in the winter of 1957. The base had a capacity of 20 people and even though it was never intended to be a permanent structure, it was used for nearly 20 years. This original station was abandoned in 1975 and is now completely buried, it was possible previously to visit this base though now it is no longer allowed visitors at all as the weight of so much snow and ice has caused the roof to collapse and it is in a dangerous state (it is also a long way beneath the surface, so probably isn't that nice a place to go now!). The next station was built by the National Science Foundation (NSF) in 1974, it consisted of a geodesic dome 50m wide (165 feet) and 16 m high (50 feet) which was the main station which housed the accommodation and laboratories. The dome itself was a protective skin, inside it were three conventional two story wooden buildings. There were also metal arches that housed such things as power plants, fuel and other equipment that either didn't need to kept close to the accommodation or could be readily stored without any heating. This base had a capacity of 30 people though up to 80 more could be accommodated during the summer months in particular, in huts and tents ("Jamesways", very substantial walk in tents as developed in the Korean War). The dome itself was not so much a building, but a protective shell made of aluminium panels attached to a metal framework inside which there were wooden buildings that were the accommodation units. The dome was there to protect the buildings inside from wind and snow build up, though there was still some ice accumulation inside due to condensation. The buildings were heated but the space inside the dome wasn't. The buildings had windows though they just looked out onto the inside on the dome, they were boarded up to improve insulation so like a number of earlier Antarctic Stations, it took a fair effort to get out of the base and see something other than rooms without windows. 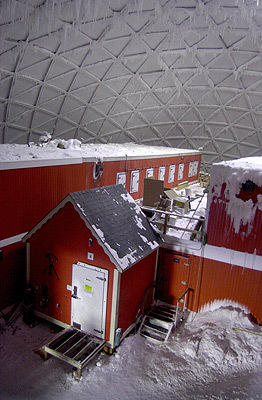 The dome was dismantled and removed from Antarctica during the 2009/10 season. It had been intended to last for 10, maybe 15 years, but in the end was in place for nearly 35 years. 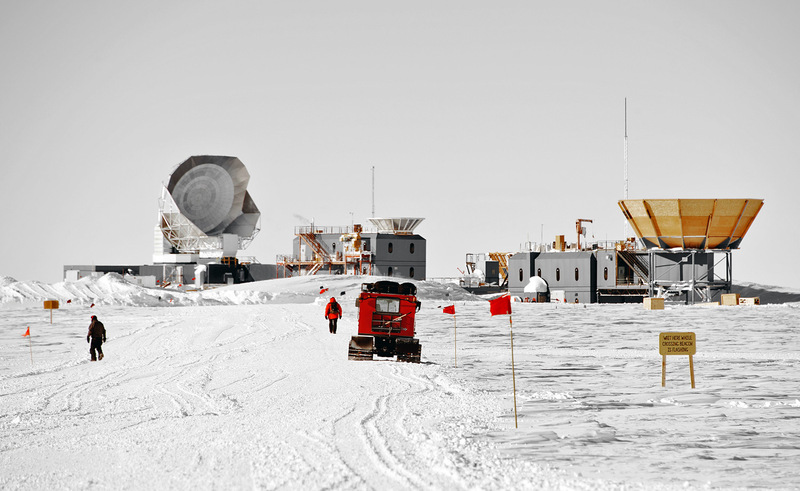 Work on a new South Polar station started in 1997 as the population requirement at the South Pole was growing and there were problems with the dome being buried in drifting snow needing to be constantly dug-out to keep it operational. The new base was dedicated in January 2008. It has a full compliment of 154 personnel and 65,000 square footage in the main two buildings. 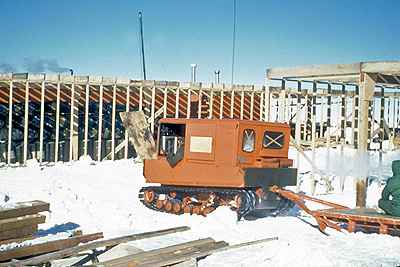 The new station is an elevated station consisting of two main buildings supported 10 feet above the snow surface on jackable legs which are 2 feet diameter thick-walled pipes. The whole building is shaped like an aerofoil the long edge of which faces into the direction of the prevailing winds. The shape forces air under the building where it accelerates and clears out built up snow. There are rounded corners wherever possible as this helps to reduce snow drifts. The legs allow for the whole building to be raised up to two more stories to stay clear of the snow surface in the future. A possible problem with such structures is that there can be differential sinking of some parts of the building due to "ice creep" where ice moves under local compression due to the weight on a particular leg. The building is designed to make it possible to raise it on individual legs to accommodate this and keep the building level. There are two main buildings which are U-shaped when seen from the air. They are separate as a safety measure in case of fire though there is an aerodynamic "architectural membrane" that connects the two buildings to help channel the wind to scour the area between them and so avoid snow build up. The two modules can operate independently so one can be shut down in the winter when the population is greatly reduced from the summer high. They are wooden buildings with particle board being used for the outside panels (pale brown in the photos) though this has been covered in a metal cladding (dark grey). Before the new station was built a 12 foot high model was made and put in position for a full year to see where snow drifts formed and if the chamfered edges were effective or not. Building on the station began in 2000 and largely finished in 2007, the last of the cladding being added in the 2008/2009 season. The new station has windows that can see out for the first time! The buried base obviously didn't have anything you could see out of and the buildings in the dome just looked out into the interior of the dome unless they were boarded up (as they mainly were to keep the heat in). There are significant psychological benefits to being able to see outside through windows although it does pose technical challenges as windows leak heat far more than the building walls and it can regularly get to be a 70C temperature difference between the inside and the outside of the window which gives problems with sealing them. 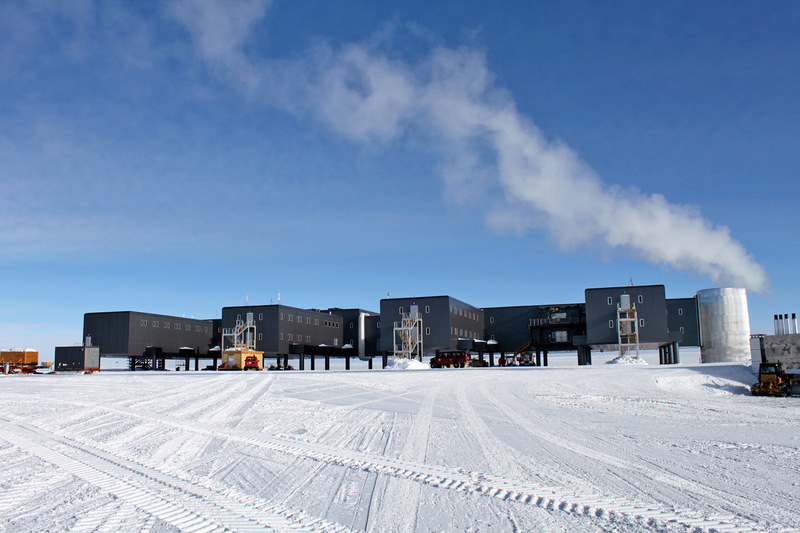 The New South Pole Station has to have probably the biggest construction carbon footprint of any building in the world. Amundsen and Scott got their teams to the South Pole overland in 1911/1912, so did Fuchs and Hilary in 1958, more recently a trial team made a road there to deliver a load of 110 tons of cargo overland in 2006. The vast majority of everyone else and everything that has been to the pole and back has flown there. 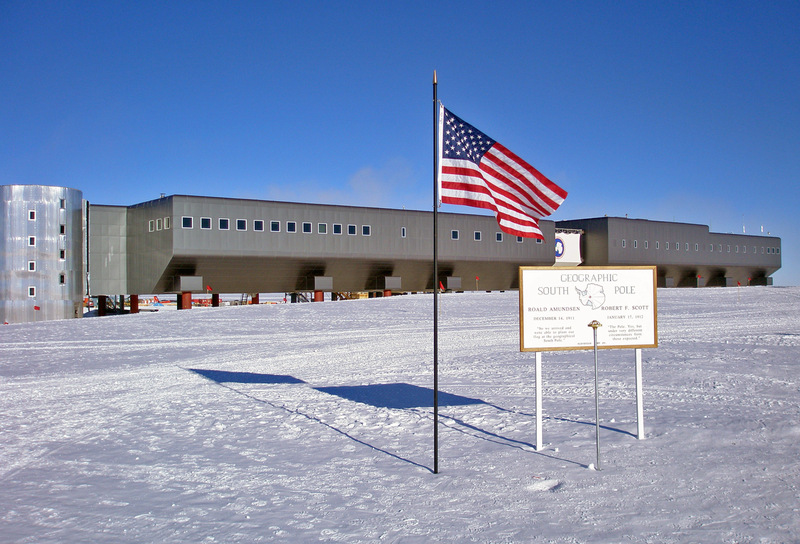 An estimated 20 million pounds (9,070 tonnes) of materials for the new station had to be flown to the South Pole from New Zealand after being shipped from the USA. This was flown in LC-130 (Hercules) aircraft which have a maximum load of 25,000lbs (11.3 tonnes) the size of the load bay restricts the largest dimension of anything that can be taken to the South Pole. 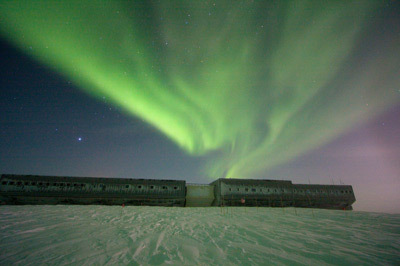 The return flight to the South Pole from Christchurch New Zealand is about a 4,200 mile (7780 kilometres) round trip. That's well over 3.3 million miles worth (6.2 million kilometres) of flying to build the base. The base is run on fossil fuels that are also flown in on the LC-130 Hercules aircraft. On the trip from McMurdo to the South Pole alone, these aircraft burn two gallons of fuel for every one gallon delivered.